An ancient painting at Wat Khao Chan Ngam in Nakhon Ratchasima. "It is because Isan features many mountains, which cavemen used as shelter and left their imprints through rock paintings," said Sunisa Chitrbhandh, an anthropologist and director of the administration office of the Fine Arts Department. In addition, there are also paintings dating back 2,500 to 3,000 years in Phu Phrabat Historical Park in Udon Thani showing figures of men with hunting tools and oxen. "The paintings may mean they were farmers or hunters," Sunisa noted. There are also groups of ancient paintings over a cliff in Nakhon Ratchasima. One group is known as the most beautiful prehistoric painting of people found in Thailand. It shows a group of people wearing what looks like skirts made of leaves. They are men, women and children engaging in activities ranging from hunting to dancing and playing. It is believed that the paintings were created by people living in the area around 3,000-4,000 years ago. But the colour has never faded. "It is fortunate that those paintings in Nakhon Ratchasima are taken care of by monks of Wat Khao Chan Ngam," Sunisa said. The temple also put a seated Buddha image below the painted cliff as a virtual fence to stop people from getting too close to the cliff. 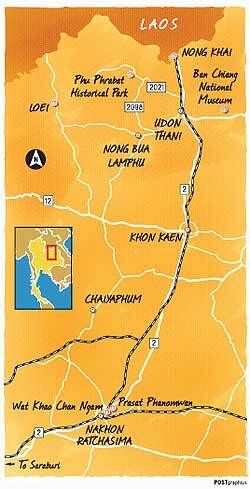 Apart from the ancient paintings, the northeastern region also contains evidence of prehistoric settlements in Ban Chiang, Udon Thani. 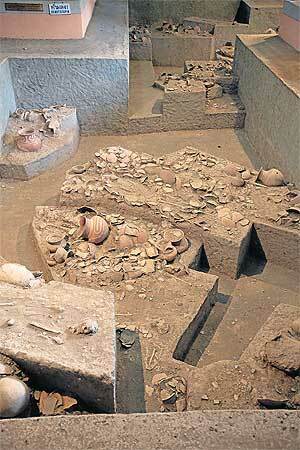 The archaeological site showed people knew how to farm, build and use tools like metal instruments and clay pots. Evidence of this is kept at the Ban Chiang museum and dates back to 1,800-5,600 years. Bang Chiang is also listed as a Unesco World Heritage site and is regarded as the most important prehistoric settlement discovered in Southeast Asia. The Dvaravati period (9th-12th century) also brought its culture to the Northeast. For example, gigantic, weird shaped rocks in Phu Phrabat Historical Park in Udon Thani are believed to be a cluster of Dvaravati temples dating back 1,200 years. Historians suggest that the rocks were sacred places due to the layout of sema, a temple boundary stone marker, encircling a large sacred stone, according to park officer Thada Sungthong. The format was unique to the Dvaravati period as the sema stones were placed in eight directions. 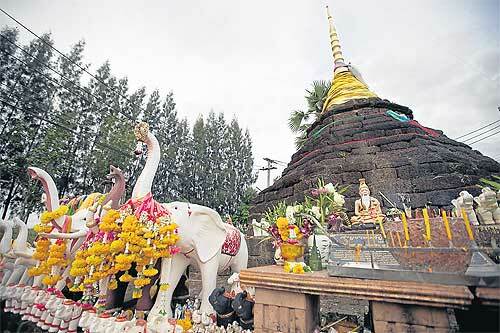 Phu Phrabat is one of the places where visitors can still see the layout of an ancient Dvaravati temple, Thada said. A cultural tour in Isan must not end without a visit to Khmer-influenced sites. One newly renovated site is Prasat Phanom Wan in Nakhon Ratchasima, first built 1,105 years ago by Khmer King Yasovarman I, as a Hindu temple. It was turned into a Buddhist temple during the Ayutthaya period. The ruin is still a sacred place for locals, and houses standing Buddha images, ancient Khmer inscriptions and lintels. Exploring Isan's archaeological sites lets people understand the fact that the Northeast is home to ancient civilisations in Thailand. Standing about 10m above ground level is the iconic rock named Hor Nang Usa in Phu Phrabat Historical Park in Udon Thani. It is believed to be used as a place for meditation during the Dvaravati period. The historical park houses stunning rock structures, naturally carved by the rain and wind for millions of years. The Fine Arts Department found 68 prehistoric archaeological sites, including 45 cave paintings and 23 scared places within the 3,430 rai plot. The park is now on a tentative list of Unesco World Heritage sites. These ancient human figure paintings are found only in two places in Phu Phrabat Historical Park. One is at the Khon Cave, which displays seven humans figures painted in red and white. Another is located in a cave called Pheung Hin Wat Pho Ta, but is not as clear as those in the Khon Cave. The temple boundary stones (sema) created during the 9th -12th century in the Dvaravati period have been left unattended inside Wat Phra Phutthabat Bua Ban, a forest temple, about 18km away from Phu Phrabat Historical Park. The stones were arranged in eight directions to encircle a sacred stone at the centre. However, the central stone no longer exists. In each direction, there are three stones in a row. Each stone is of a different height, and laid in decending order. At the base of the largest stone, there are different designs of carved work such as figures of apsaras, heavenly female spirits often found in Hindu mythology. According to Srisakra Vollibhotama, well-known archaeologist and anthropologist, the place is the only spot in Thailand to see how each sema was originally lined in Dvaravati temples. The Fine Arts Department had a roof made on top of each row of these boundary stones as protection, but the structure is in poor condition. Not far from the group of stones, there are more boundary stones left abandoned and scattered around a cliff. The small golden stupa on top of the old sandstone blocks is called Phra That Phon Thong. Judging by abundant offerings encircled the base, the stupa is a sacred place for locals. People also honk while driving past the stupa as a mark of respect. Built during the Khmer Empire, the stupa housed relics of the Buddha and gold Buddha images, which were transferred to local temples in Udon Thani when the Highway 22 was constructed in 1909. The local municipality of Nong Bua set aside a 1.2 million baht budget to renovate the area and also build another structure to house a seated Buddha not far from the stupa. Phra That Phon Thong is not far from downtown Udon Thani and is along Highway 22 heading towards the Ban Chiang archaeological site. The Ban Chiang archeological site isamust see for those who visit Udon Thani. It comprises two parts; the national museum and the excavation pit in Wat Pho Si Nai,about 500 m away. If you visited the place before February2010,a revisit is a must.The museum has under gone amajor face lift, bringing it on par with international standards. On entering the museum,a step-by-step explanation describes how archaeologists worked when they found the ancient items in Ban Chiang in 1972. Also exhibited is how prehistoric people buried their dead. During the early period, or about 5,600-3,000 years ago, a body was laid flat and face up, or in a foetal position,and had a piece of pottery buried with it. 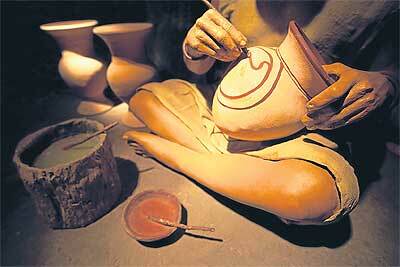 During the middle period (3,000 years to 2,300 years ago), the body was laid flat covered with pieces of broken pots. In the last period —2,300-1,800 years ago—the body was still laid flat, but only pots in good condition were put beside the body. ‘‘The jars put along with the dead were never used in daily life,’’ said a museum guide. If a child died,he or she was put inside a jar before being buried. Bodies found in Ban Chiang had an average age of 31, the guide said. The excavation pit at Wat Pho Si Nai was recently renovated, and the pottery found here is on display in the museum. What is on display in the pit are copies of the real thing. The pit has 52 graves found from the three periods, which are differentiated by soil layers. The deepest, which has only one grave to the west of the pit, was the tomb of a person who lived here 5,600-3,000 years ago. The second layer has tombs of those that lived in the middle period and the uppermost layer has tombs from 2,300-1,800 years ago. The exhibition is a collection of artifacts found in each tomb, along with demonstration rooms displaying the lives of prehistoric people. The artifacts are on display in groups such as hunting tools made from bone or stone, cooking tools, and dressing accessories such as bronze bracelets and bells. 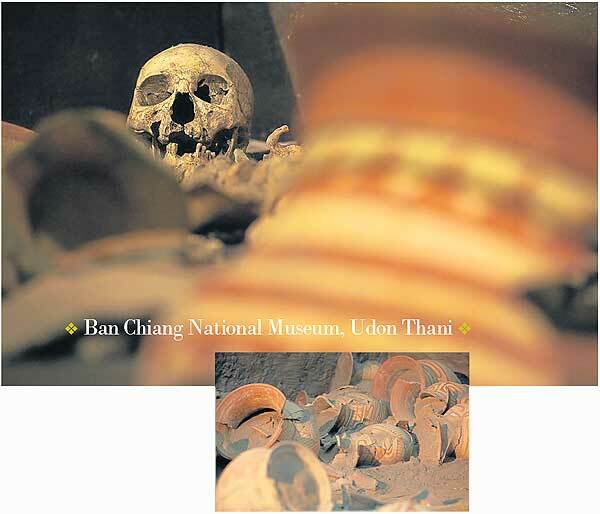 Also displayed are human skeletons found in Bang Chiang excavation pits, as well as animal skulls and bones. According to the museum guide, pottery found in the graves was produced in different shapes and colours depending on the period. During the early period, clay pots were black or white and had simple deigns made with rope or simple tools to mark the surface. Pottery during the middle period had round bottoms, thicker edges and the bottom half of the pots were painted in red. The last period— 2,300-1,800 years ago—were the most beautiful, all the pots were painted in red and had various designs on them. Prasat Phanom Wan in Nakhon Ratchasima is a bit low profile when compared to Phimai Historical Park,however, it is older, according to Phimai Historical Park officer Dusit Tumpaporn. ‘‘We found traces of an old road linking both ruins.The distance is about40 km,but the road does not exist anymore,’’ he said. Prasat Phanom Wan was built by two Khmer kings. First in 907 ADby King Yasovarman I. The Hindu temple consisted of eight shrines, with the main chapel being15 m tall, and housed a lingam and yoni. But these have since disappeared, Dusit added. From 1050-1066 AD, the temple was rebuilt by King Udayadityavarman II with a new main chapel and a colonnade (rabiang kot) surrounding the temple.They were made of pink sandstone, and construction took many years. It remains unfinished. King JayavarmanVI (1080-1107AD) continued to maintain the temple, but did not finish its construction.He used most of his manpower to build a new Hindu temple, which is now Phimai Historical Park, said Dusit.During the construction of Phimai, the king used Prasat Phanom Wan for ritual ceremonies as depicted in a Khmer inscription inside the temple. ‘‘In the inscription, the king called the templePrasatDhevaSom,or the shrine of the deity,’’ said Dusit. TheFine ArtsDepartmentstarted renovating the templelast year.A few missing stones were replaced with white sandstones, because the department believes that within a couple of years, all the new stones will darken with age and look like the old ones. The Ban Chiang National Museum is open daily, except Monday, from 8.30-4.30pm. The entrance fee for Thais is 30 baht and 150 baht for foreigners. The excavation site in Wat Pho Si Nai is managed by the museum so it is operational on the same days. It, however, remains open till 6pm. Call 042-208-340/1. Phu Phrabat Historical Park is open daily from 8am to 6pm. The entrance fee for Thais is 20 baht and 100 baht for foreigners. Call 042-251-350_2. Prasat Phanom Wan is about 15km east of Muang of Nakhon Ratchasima (Korat). Use Highway 22 and turn to a local road for the last 5km. Wat Khao Chan Ngam is about 10km east of Muang district in Korat. The entrance of the temple is on Highway 22. Look out for a small sign with the temple name before turning to a small local road for the last 3km.